Are You Irish, With Young Children And An iPad/iPhone? You may like Alphabeast so. Chris Judge wrote and illustrated [kid’s book] The Lonely Beast and, last November, it won an Irish Book Award. Chris, his brother Simon and their friend James Kelleher, all from Dublin, then created a flash card app based on the book, for iPad and iPhone and iPod (Touch). 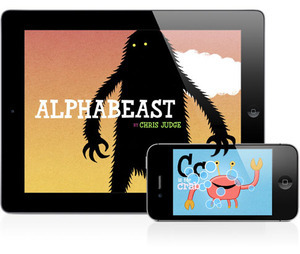 It’s a rather slick, funny, interactive app which helps kids learn their ABCs. There are loads of sounds, musical instruments, dancing robots, spinning bow ties and laughing monkeys involved. Ewok and Bodger Kids seem to LOVE it and giggle their socks off when they use it. It could well be the future of toddler learning. It’s €2.39. But available for just 79c tomorrow, Paddy’s Day. For iPad buy here. For iPhone buy here. Posted in Misc and tagged Alphabeast, app at 5:45 pm on March 16, 2012 by Broadsheet.